The teaching of English is fundamental to everything we do at Hutton CE Primary School. Literacy lessons take place daily in every class in the school and opportunities are frequently provided for children to develop their oracy, reading and writing across the scope of the curriculum. Our goal is for children to develop into confident speakers, thoughtful and reflective listeners, enthusiastic readers and engaging writers. Throughout the school, the children are involved in activities which help them to gain more knowledge about how to improve their own writing. The use of Learning Without Limits allows all pupils to challenge themselves and raise their own expectations about the writer they can become. We believe it is important that children see their work as having real purpose and that they regard themselves as authors to a variety of audiences. At Hutton CE Primary School, we strive to instill a love of language into the hearts and minds of all our pupils. 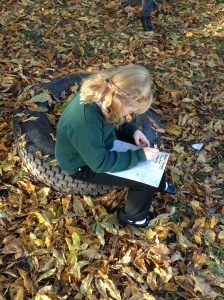 We find that children’s writing is enriched when pupils are exposed to a wide range of stories and genres of writing; this in turn helps develop a structure to build upon and leads to a discovery of exciting and rich vocabulary. At Hutton, children are encouraged to develop a love of books and are given many opportunities to listen to stories, to share books with each other and to choose fiction and non-fiction. Children are expected to read daily at home and we encourage a dialogue between home and school in the form of a reading log. In Reception, Year 1 and Year 2 phonics is taught using the Letters and Sounds and North Somerset Learning Exchange Programme for Phonics into Early Spelling. These lessons are taught as discrete whole class lessons. As children move through the early phases of phonics, they practice by reading texts from the Oxford Reading Tree scheme which are mainly decodable. These texts also include sight words (non-decodable) to broaden their vocabulary. There are fiction and non-fiction books within each Oxford Reading Tree level and parents are made aware of the supporting Oxford Owls website. We hold phonics and reading strategy meetings throughout the year to support parents in helping their child learn to read and spell. Drama is encouraged from the early years, which begins as role-play and develops through techniques such as hot-seating, improvisation and story re-enactment. 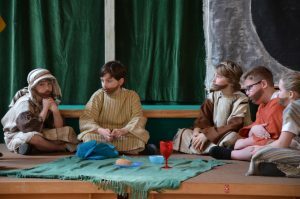 Opportunities for formal performances enable the children to develop their drama skills through class Collective Worship and Seasonal Plays.